Taking time for regular self care to unwind from the outside world is essential. If you’re the lucky owner of a bathtub, I really recommend some home spa time with this amazing homemade lavender coconut milk bath soak. It’s relaxing, it nourishes your skin and leaves it super soft! And if you don’t have a bathtub, you can use it to take a foot bath with which is fantastic after a long day of being on your feet. Lavender, a native plant to the Mediterranean and North-African area has a beautiful, unique fragrance. It has been used for thousands of years by itself or as a base in perfumes, body care and cleaning products. Lavender oil is one of the most popular essential oils. It is famous for its relaxing properties; the scent is calming and helps you sleep better. Lavender is great for your skin too. It has strong healing, anti-aging and anti-inflammatory properties. Plus it improves blood circulation and can soothe different skin conditions such as eczema, psoriasis and acne. While many people use it as an essential oil (it’s amazing for massages and sore muscles!) you can also use the plant. This is what I did in this homemade lavender coconut milk bath soak. 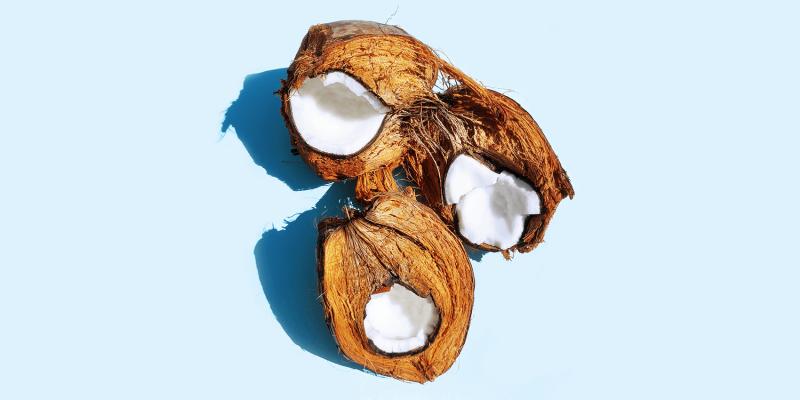 Coconut milk is a very rich, moisturizing natural product full with nourishing fatty acids, vitamins and minerals. This creamy milk is great to cook with, but our skin and hair love it too. Epsom salt is a mineral compound found in natural springs in Epsom, England. You might know this important mineral compound as magnesium sulfate. Nowadays many people have a magnesium deficiency. Besides taking supplements for it, regular magnesium baths also do wonders. Epsom salt baths relax your body and mind, ease muscle pains and help your body detox. It also exfoliates skin and helps increase the magnesium levels in your body. Shake the cans with coconut milk so that you get an equally mixed, creamy texture. Coconut milk tends to separate the cream from the water, especially when it’s cold, so make sure to shake well. 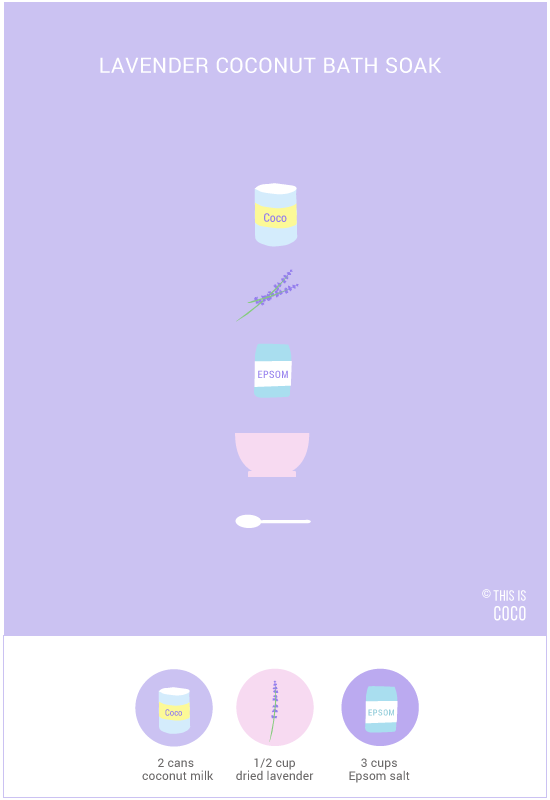 Mix the coconut milk with the lavender and Epsom salt. Pour the mixture into your bath water. Bathe for at least half an hour to get the full benefits of this pampering treatment. Enjoy the silky, relaxing smoothness of your home spa bath with your favorite tunes in the background and dimmed lights or candles.